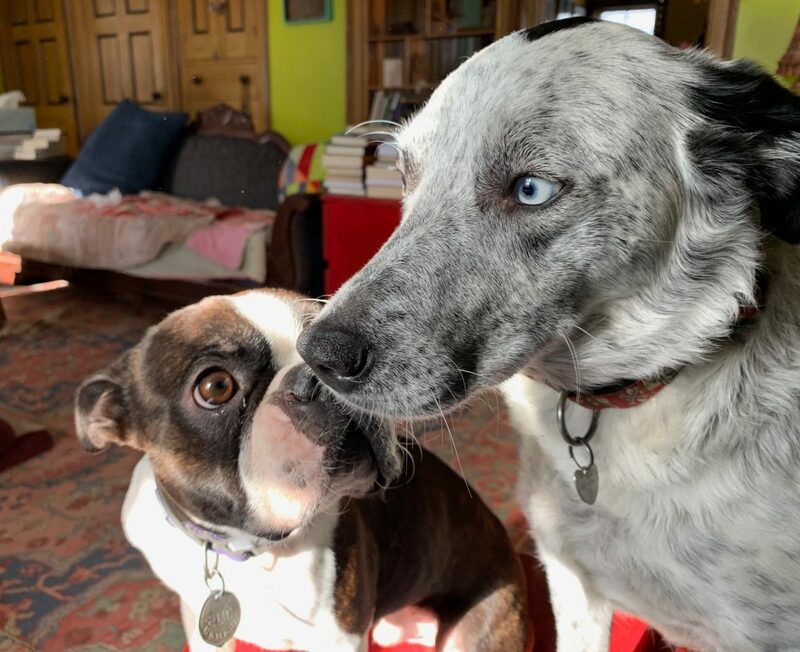 Don’t be fooled by the cute photos, these two – Bud and Fate – are hell-raisers, partners in crime, two thugs. They tear around the yard and the house, they bury bones and treats, they squabble over chew bones, they wrestle and play for hours on end, they jump up and down on sofas and chairs, bury our shoes in secret places. They are great fun, two happy dogs, two dominant creatures, each acclimating to the other happily. He retaliated by getting hold of one of her paps somehow, and bringing her to the ground. It didn’t look like fun to me, but they both had a blast. I’ve started thinking of them as “Beauty And The Beast.” But they both are beasts.